Crater Rim Drive in ^Hawaii Volcanoes National Park (HVNP) is an 11-mile loop around the 4-mile-wide summit caldera of ^Kilauea ("spewing"), the world's most active volcano and now the main locus of Hawaiian hot-spot volcanism. 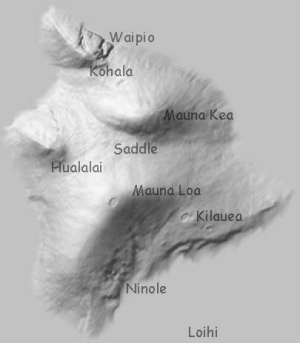 Nestled low against the east flank of 13,677 ft ^Mauna Loa, the much younger Kilauea seems a mere satellite of its giant neighbor at a mere 4,077 ft, but the two volcanoes are distinct. The magma conduits connecting Kilauea and Mauna Loa to the hot spot communicate very indirectly if at all, and Kilauea's eruptions correlate poorly with activity on Mauna Loa. Interpretive signs and materials available at HVNP are certainly worth a read for the geology-minded visitor, but I strongly recommend browsing the ^VolcanoWorld online guide to Crater Rim Drive by Steve Mattox and the well-annotated ^Hawaiian Volcano Observatory (HVO) online photo tour of the caldera before going to Kilauea. Knowing what you're seeing only enhances the wonder and beauty you'll find here. There's still much left to see and do at HVNP. Stop by the HVNP Visitor Center for informative displays and explanatory materials. Bring your appetite. The five-star restaurant at the Volcano House, across from the HVNP visitor center, is underrated. For last-minute hiking or camping supplies, try the Ace Hardware in Volcano, the little village 2 miles east of the HVNP Visitor Center. 184 KB This shot begins a right-sweeping 4-frame panorama of the Kilauea Caldera from the Keanakakoi Overlook on the south rim. 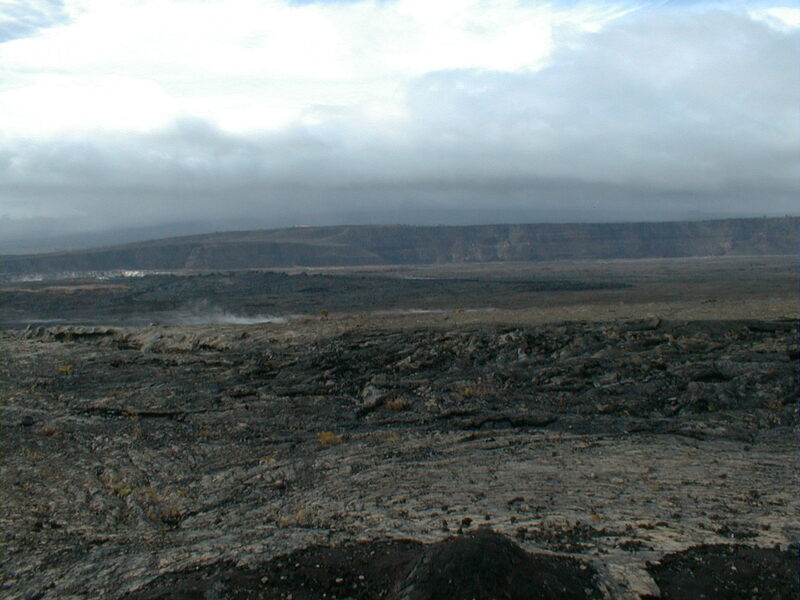 Here we look west across the Outlet, where 1974 flows brimmed over the lowest section of the caldera wall. In the left foreground is a 1974 fissure vent with a small spatter rampart down on the right. Spatter textures everything here. 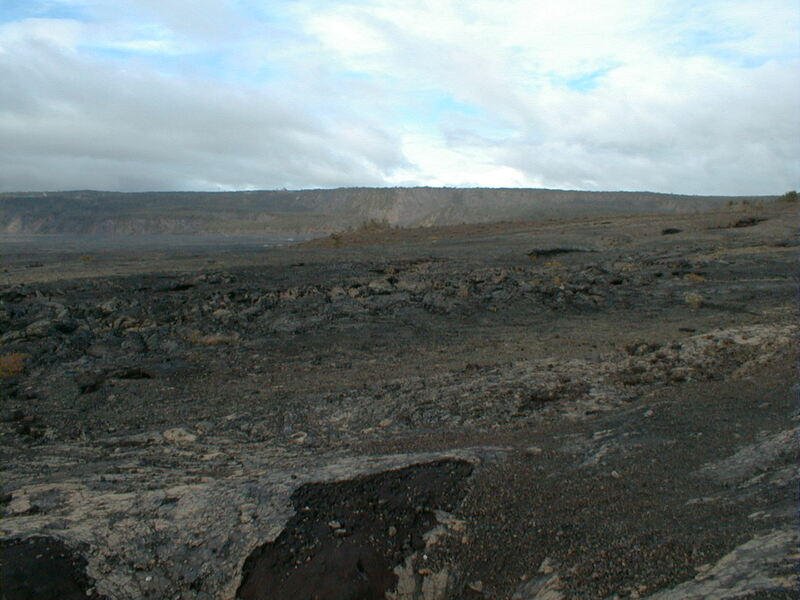 In the middle ground is Halemaumau Crater. In the distance broods ^Mauna Loa ("long mountain"), looking every bit the world's largest mountain from here. 188 KB The caldera is a fault-bounded down-dropped section of Kilauea's summit. 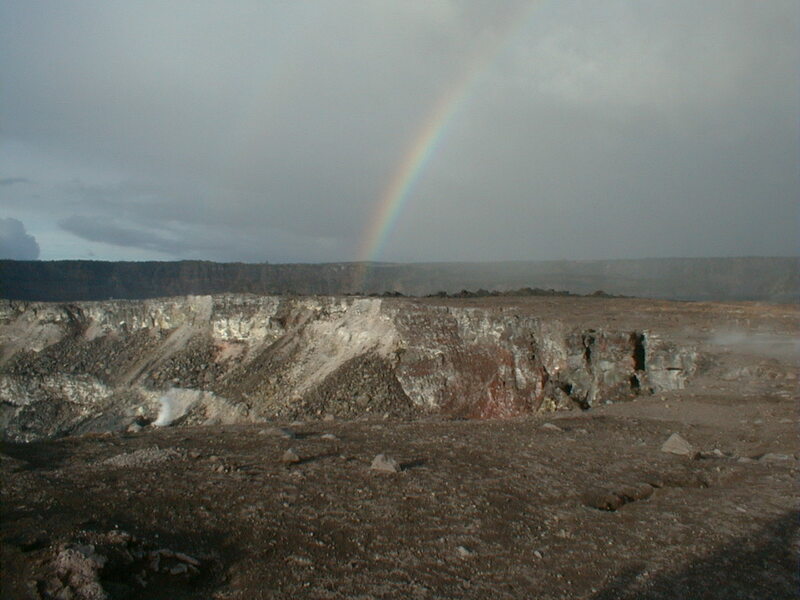 The collapse occurred in the great eruption of 1790, when a rapid and massive outpouring of lava from a submarine vent on Kilauea's east rift zone (ERZ) sufficiently emptied the summit magma chamber to leave the overlying rock without support. Step-fault blocks (middle left) complicate the west wall as the scarp comes up to full height. 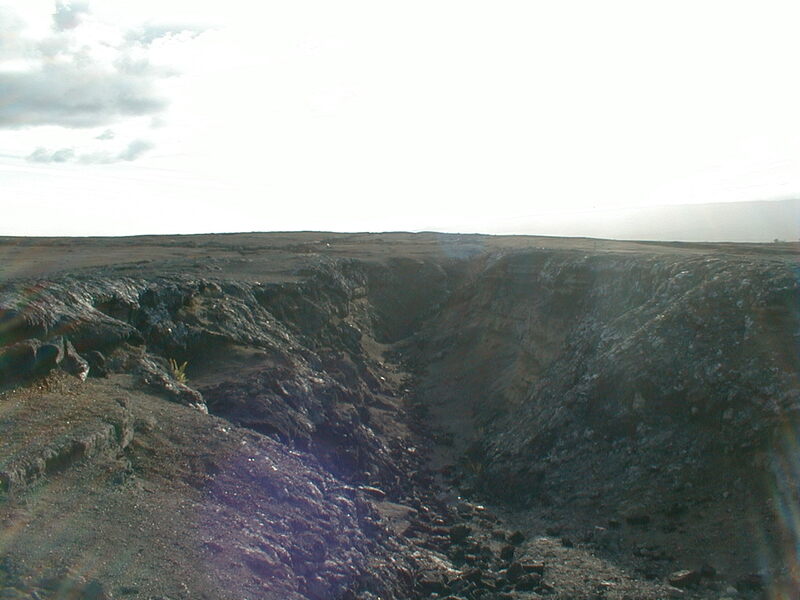 Click here for an aerial view of the caldera. 185 KB This view of the northwest caldera rim nicely shows the caldera floor. The deceptively flat-looking surface is actually a mosaic of flows dating from 1832 to 1982, as the above geologic map shows. 187 KB HVO stands watch atop the northwest caldera rim just left of center here. 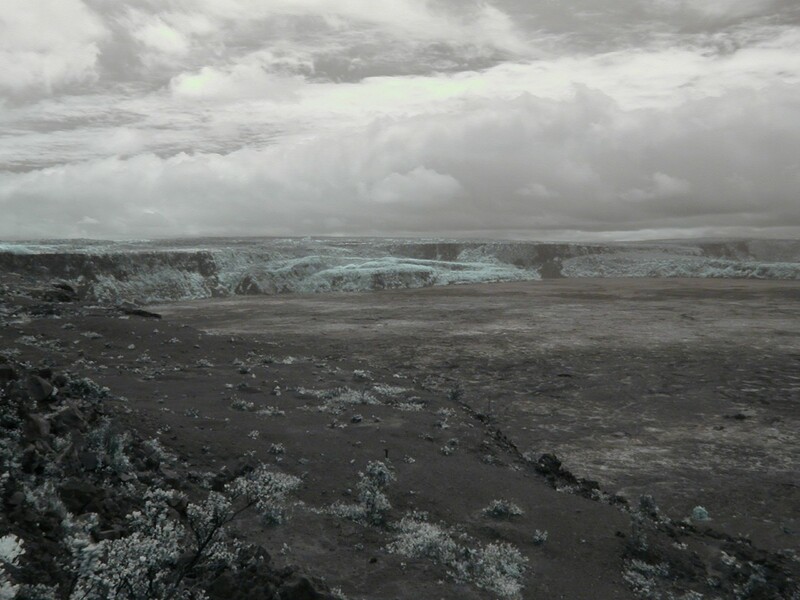 179 KB Cooling contraction created the 50-foot subsidence terrace at left at the edge of the frozen 1959 lava lake flooring Kilauea Iki ("new spewing") Crater. 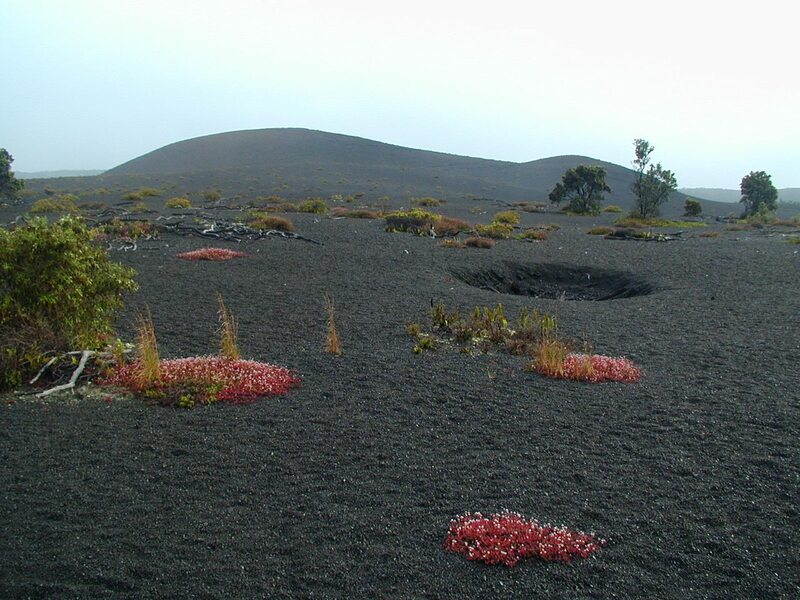 A record-high 1,900-foot lava fountain distinguished the 1959 eruption. Tradewind-blown fallout from the fountaining blanketed the aptly named Devastated Area a mile downwind to the southwest. 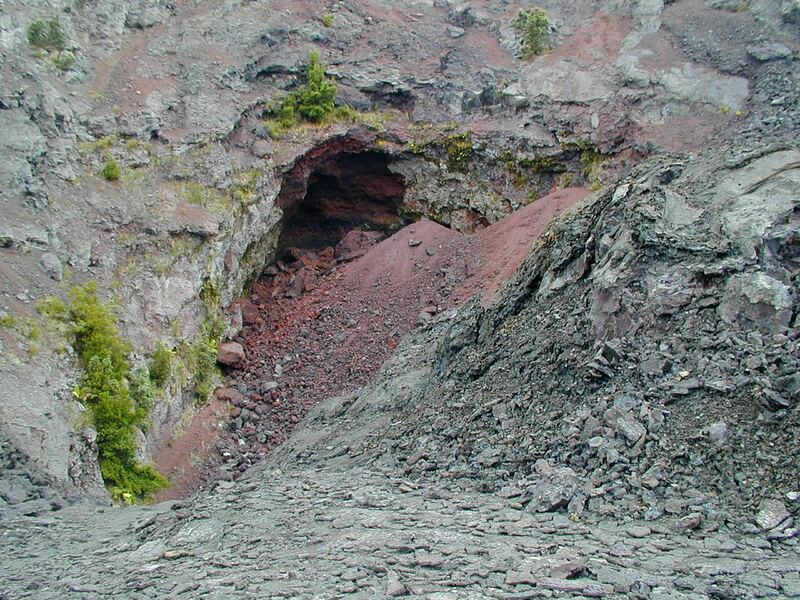 Summit collapse of the Ai Laau shield formed the Kilauea Iki crater 350 years ago. 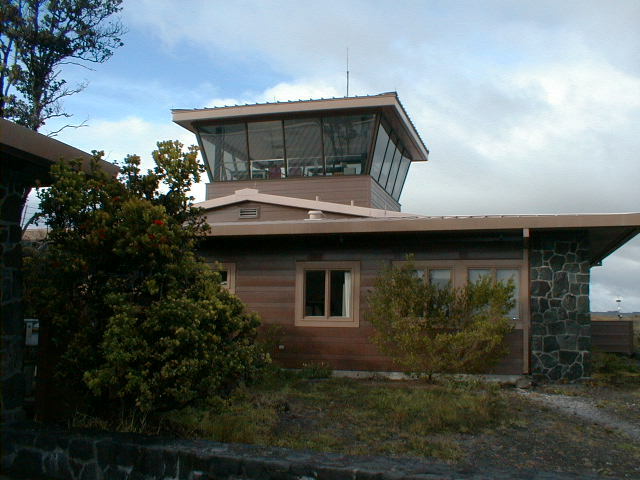 61 KB The ^Hawaiian Volcano Observatory (HVO) lookout tower. The attached Thomas A. Jagger Museum of Volcanology sells a wide selection of materials of geologic interest and houses many fascinating historical and interpretive displays, including a 3D model of the magma plumbing connecting Kilauea to the hot spot. 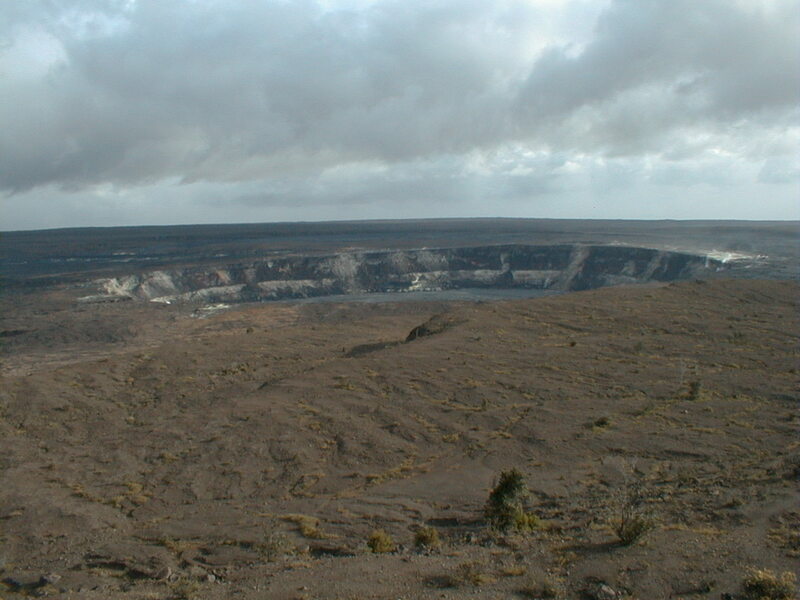 186 KB At 85 m deep and 915 m across, Halemaumau Crater dominates the view south from HVO. Halemaumau reached its present diameter and a much greater depth during the unusual 1924 phreatic eruption set off when the large lava lake occupying the crater since 1905 abruptly drained, apparently to feed a large intrusion down the ERZ. 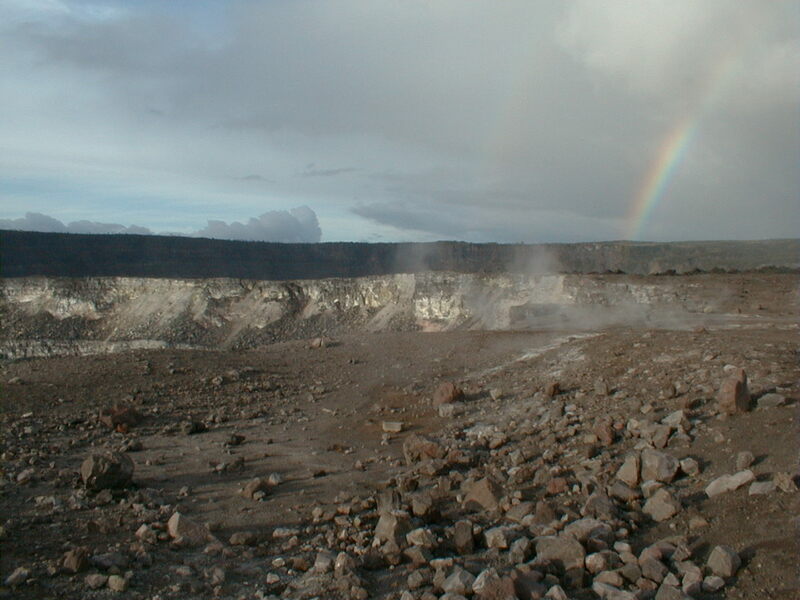 The ensuing fracturing of the crater walls brought hot rock into contact with ground water, flashing the latter to steam in a rhythmic series of explosions lasting over a week. In the course of excavating the crater to current size, these blasts showered the surrounding shield and caldera floor with 750,000 m3 of ejected wall debris, much of it still exposed today. Concurrent collapse of the floor brought Halemaumau to a depth of ~550 m, over six times deeper than it is today. 60 KB Halemaumau Crater seen from HVO again, this time at low resolution. 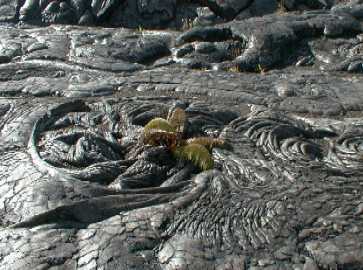 Aerial and close-up views of Halemaumau are also available. 199 KB A view ENE across the north rim of the caldera from HVO to ^Volcano House, the smaller white dot atop the scarp just left of center. Impressive step-fault blocks jostle ever so slowly down from the high north rim. 195 KB The southwest rift zone (SWRZ) intersects the caldera rim here. The SWRZ is currently much quieter than the ERZ, now the principal locus of activity on Kilauea. 173 KB Looking SSW now down the SWRZ, last active in the summit area in 1982. 186 KB The walk to the Halemaumau Overlook was beset with fumaroles issuing a nasty mix of steam and sulfur dioxide. The breathing here was quite unpleasant, and the fumes were hot enough to burn a hand held over the ground exit. 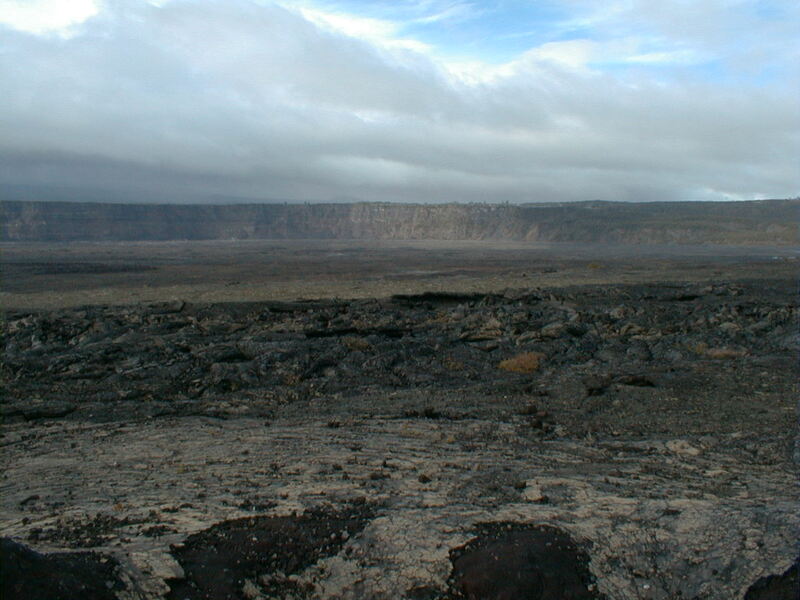 The dust and the many angular blocks littering the surface here were torn from the walls of Halemaumau in the unusually violent phreatic eruption of 1924. 193 KB At the south end of Halemaumau, slides overlap the bathtub ring left by a 1967-68 lava lake. 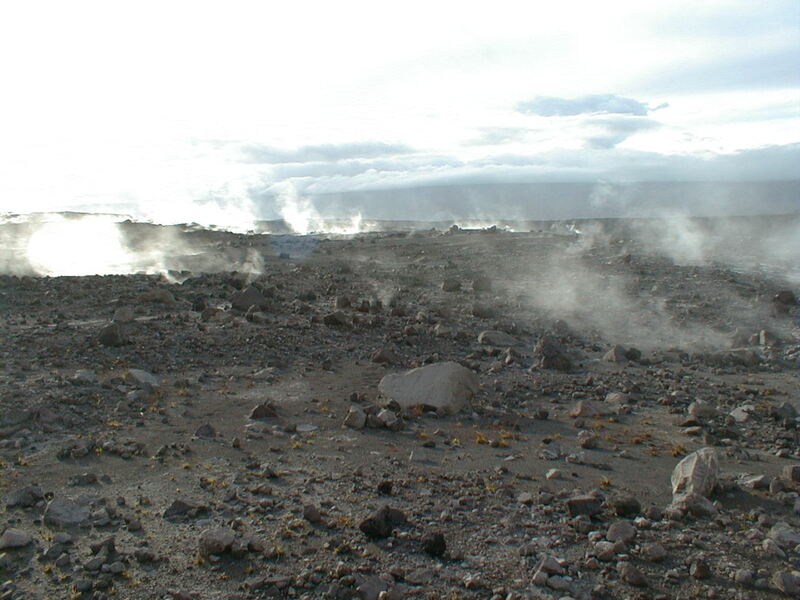 The floor was supplied by a 1974 flow spilling into the crater from the nearby SWRZ. Dark remnants of the 1974 lava fall still cling to the wall just right of the steam plume at crater's edge at the center of the photo. 180 KB The central portion of Halemaumau's west rim, with more debris from the 1924 eruption in the foreground. 185 KB Steam has oxidized the north wall of the Halemaumau Crater. Slides drape the terrace left by the 1967-68 lava lake. 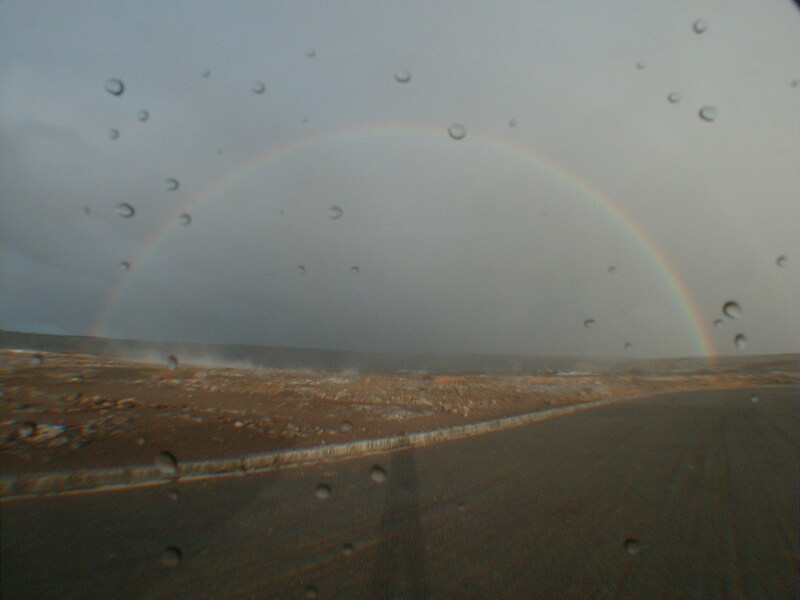 178 KB A complete 180° rainbow, the first and only I've ever seen. I couldn't see the secondary arc, but this was enough. 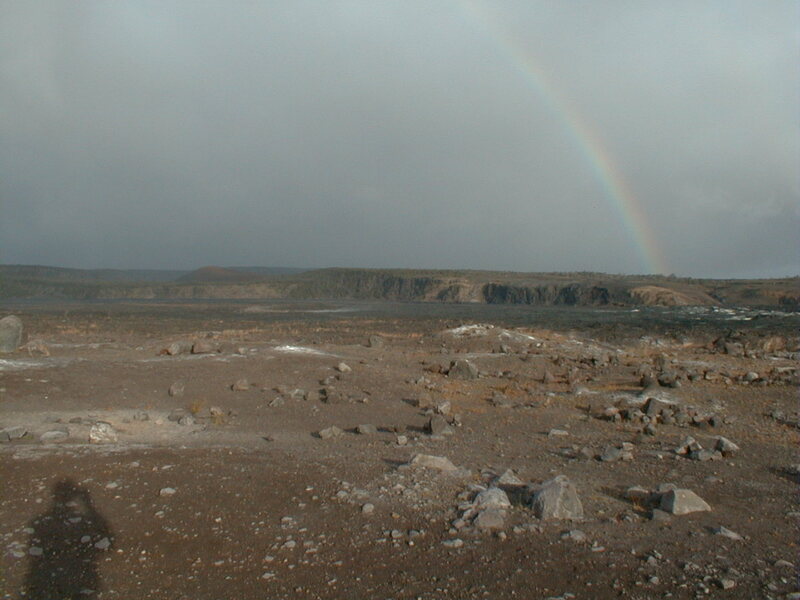 179 KB The rainbow ends in the southern part of the Kilauea Caldera beyond more 1924 dust and rock debris, here looking east from the Halemaumau overlook parking lot. And what's at the end of the rainbow? Basalt, of course. 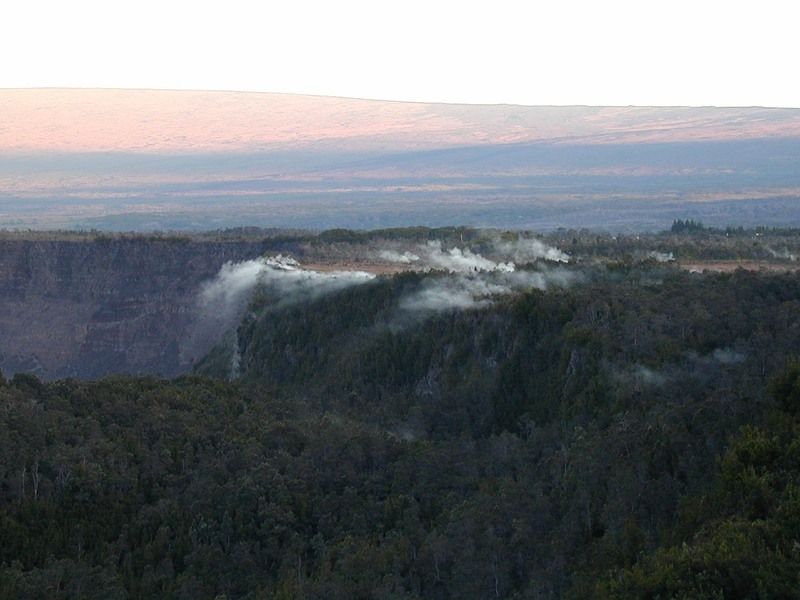 200 KB Steam vents on the south floor of Kilauea Caldera, looking southwest from Volcano House at sunrise. 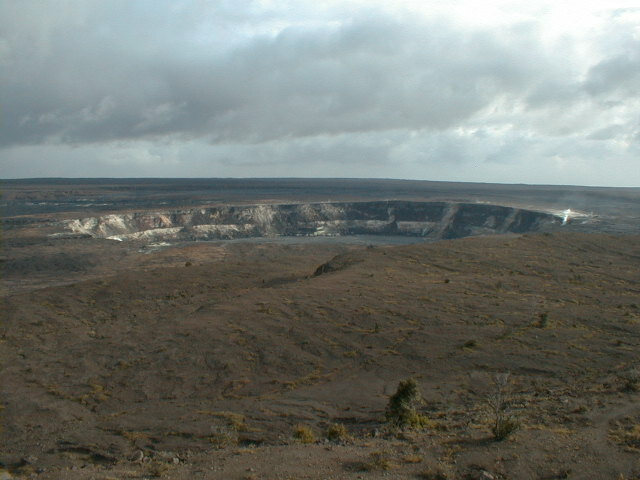 Halemaumau crater is at center and the southern limb of Mauna Loa is in the distance. June, 2000. 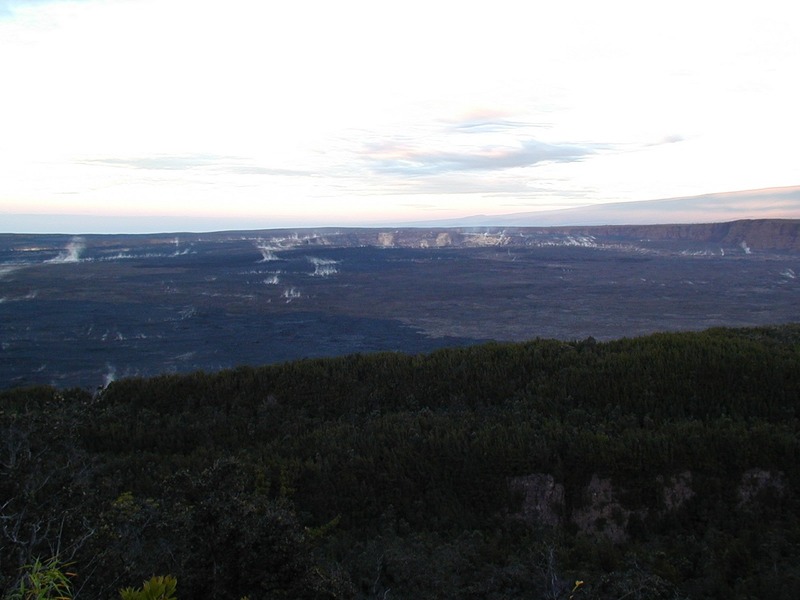 216 KB Sunrise on Mauna Loa as seen from Volcano House across the north rim of Kilauea Caldera. 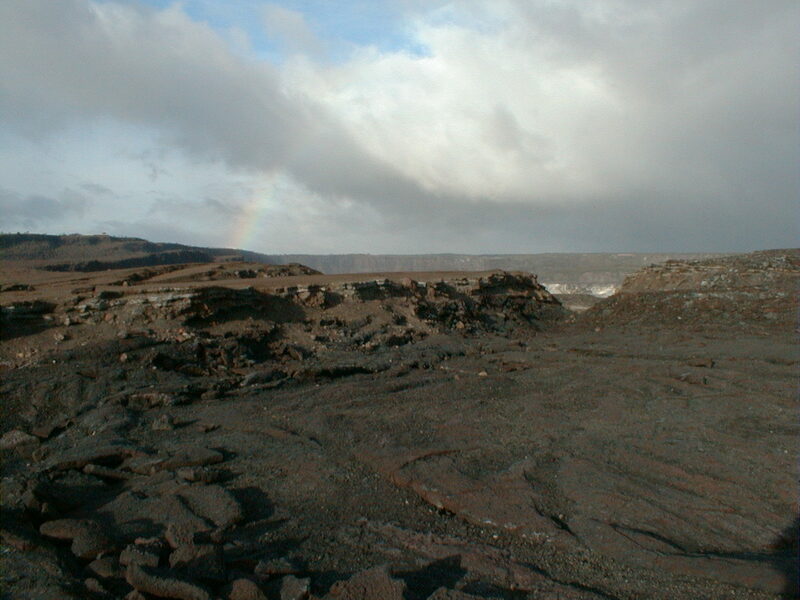 At right is Steaming Bluff, a large concentration of steam vents. 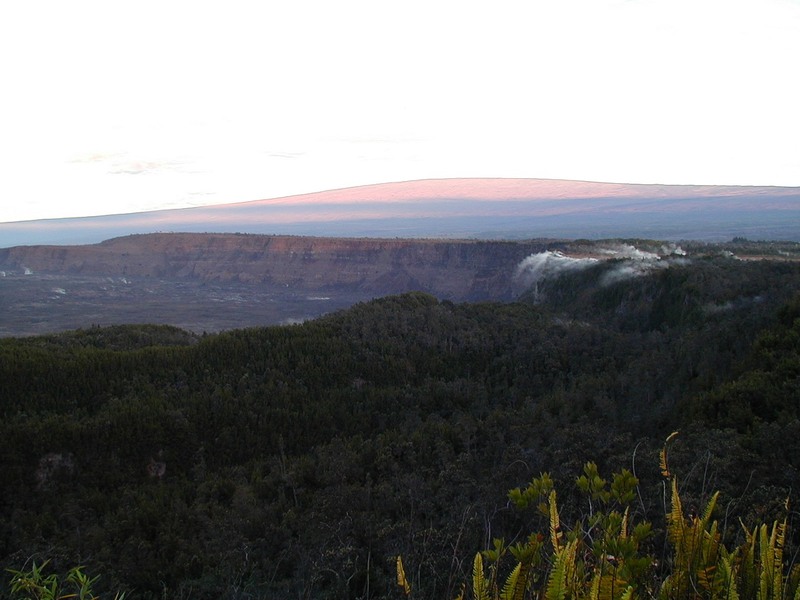 Many additional isolated steam vents dot the north and east rims of the caldera, including several around Volcano House. June, 2000. 240 KB Close-up of Steaming Bluff from Volcano House at sunrise. In the still morning air, the heavier-than-air fume cascades over the caldera rim. June, 2000. 404 KB Scattered bamboo orchids, one of only 3 native Hawaiian species, eek out an existence amid the grasses of Steaming Bluffs. Acidification of the soil by the rising gases excludes the deep-rooted plants of the surrounding rain forest, leaving a grassy meadow. June, 2000. 301 KB Hot smelly gases issuing from numerous fumaroles deposit elemental sulfur on the rocks of Sulfur Bank, an outer fault scarp of the Kilauea Caldera. The fault provides passage for the gases, which presumable emanate from the magma plumbing still running beneath the caldera. 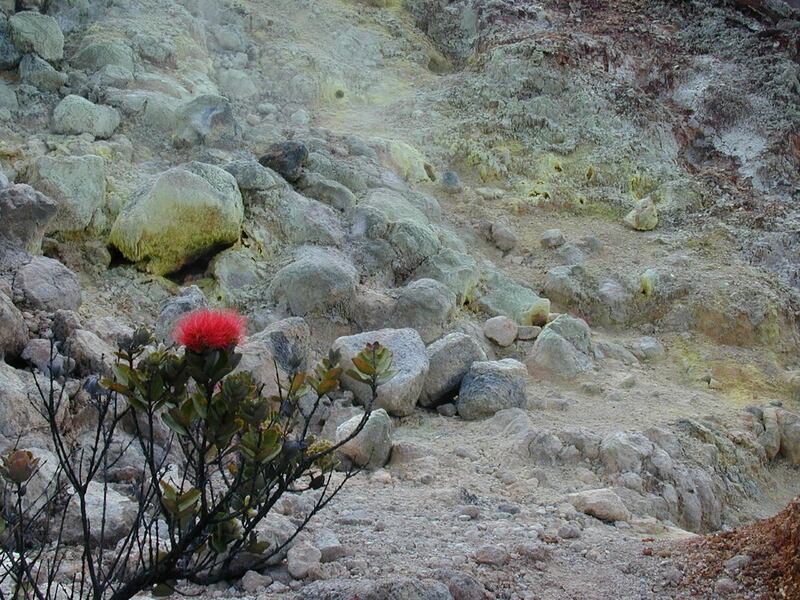 Plants like the ohia in the foreground grow surprisingly close to the gas vents. June, 2000. 233 KB ^Near-infrared photograph of the stair-step normal faults at the northeast rim of Kilauea Caldera. 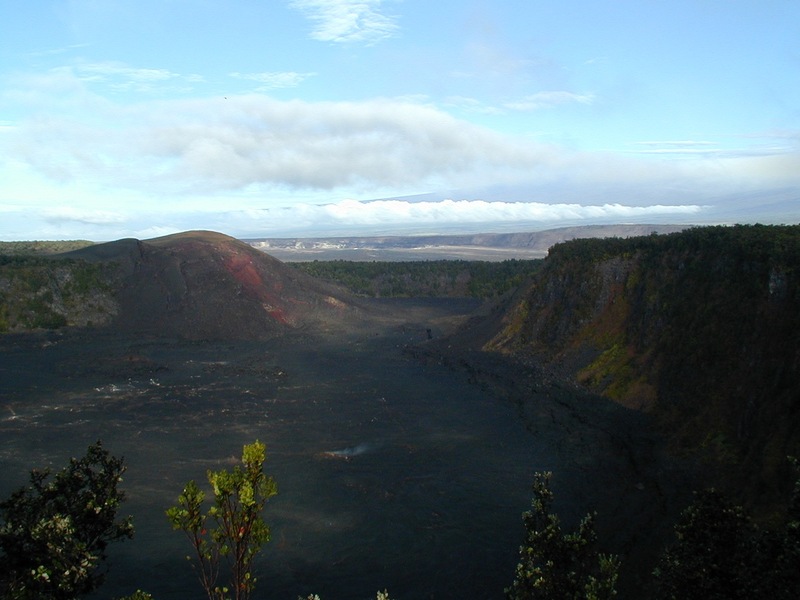 These faults and the less displaced outer caldera faults like the one above at Sulfur Bank have all participated in the collapse of the Kilauea summit. 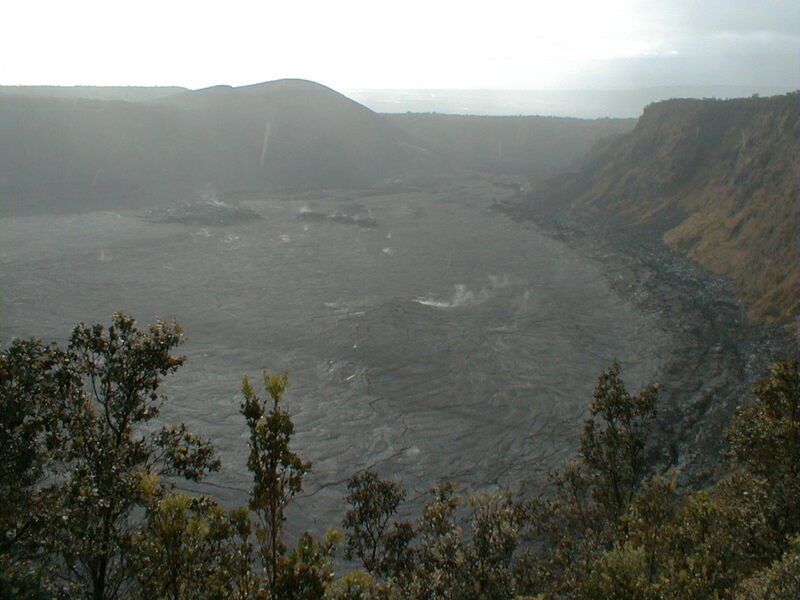 253 KB View west from Kilauea Iki Overlook showing Pu'u Pua'i cone and vent on the left. 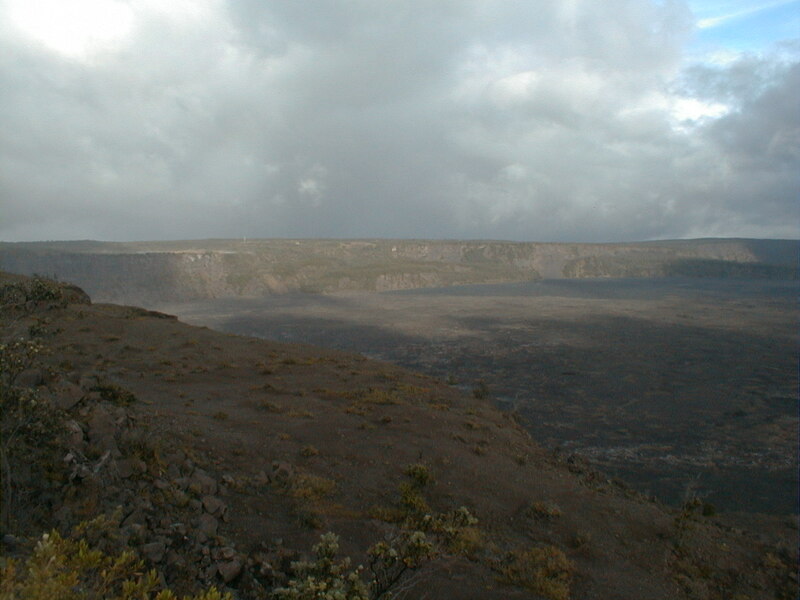 Near center is Byron Ledge, the low wall separating Kilauea Iki from the Kilauea Caldera; the south limb of Mauna Loa lies in the distance. June, 2000. 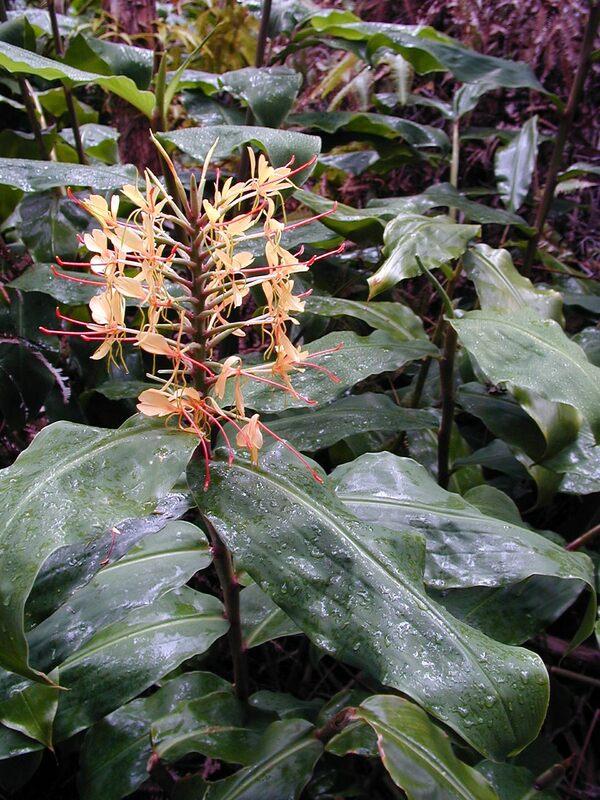 275 KB Kahili ginger is spectacular to behold, but a ranger told me that this highly invasive alien imported from Japan is rapidly taking over the rain forest at Kilauea's summit. 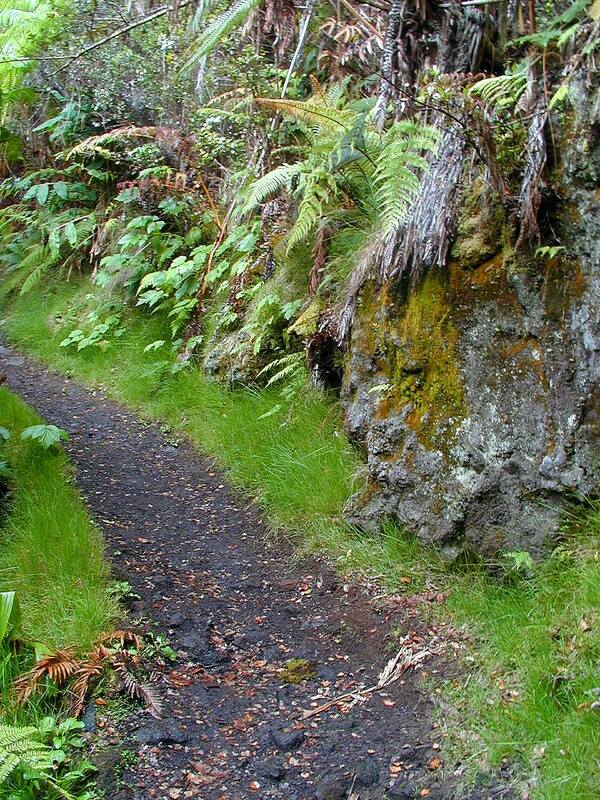 This one lives on the Crater Rim Trail en route to the floor of Kilauea Iki crater. June, 2000. 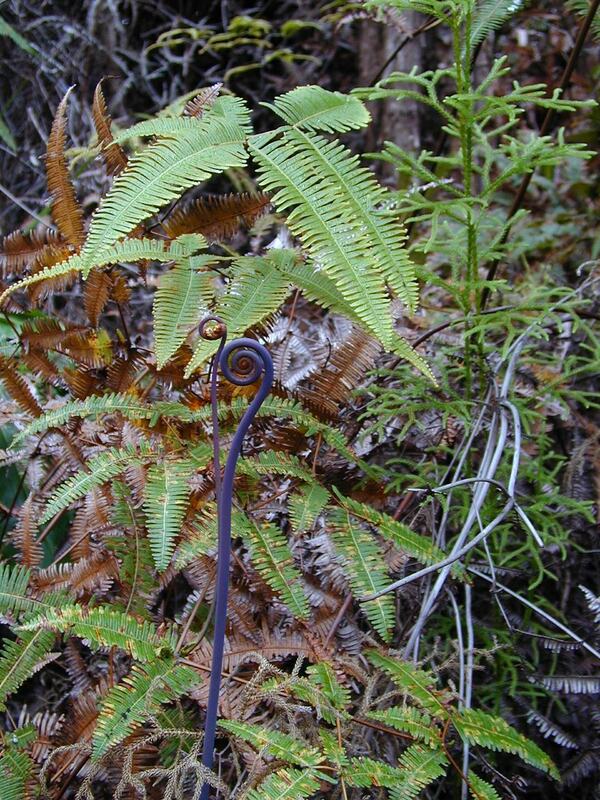 298 KB The smooth, rod-like coiled black stalk with the oddly metallic sheen is the precursor of the common rain forest fern behind it. When my kids first stumbled onto one of these black stalks, they asked me why someone was putting funny iron stakes in the ground. June, 2000. 367 KB This a'a flow at the west end of the 350-year-old Kilauea Iki pit crater is notable for its olivine basalt, a very common lava throughout the Big Island but rarely erupted at Kilauea summit. 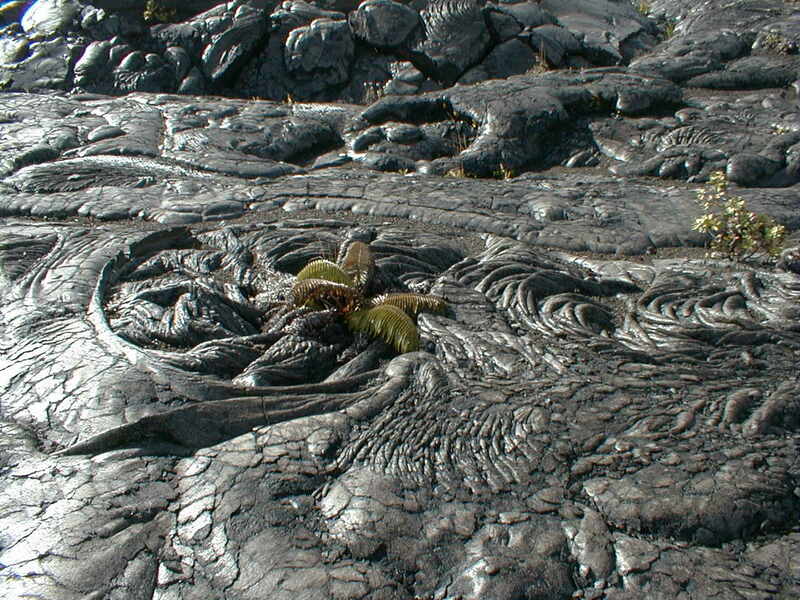 Olivine is typically one of the first minerals to crystallize from the tholeitic basaltic melts feeding Hawaiian volcanoes during their shield-building stage. June, 2000. 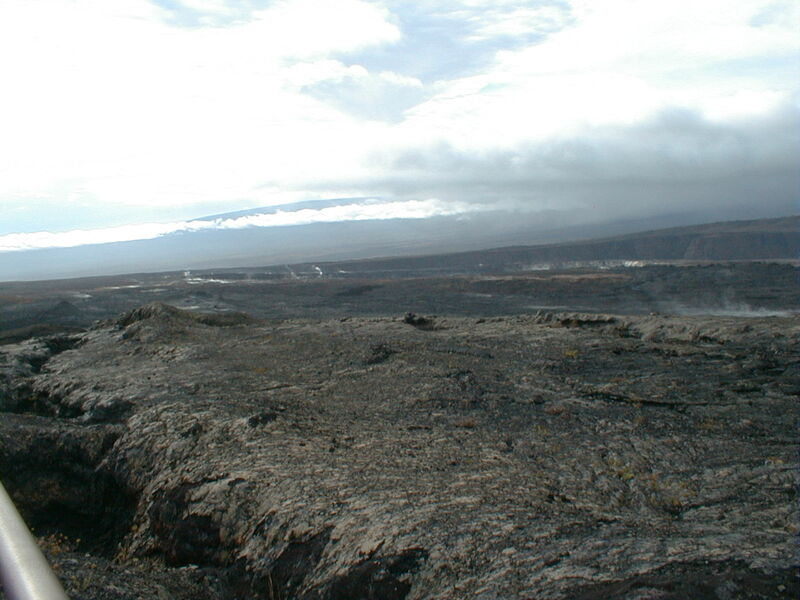 368 KB In 1959, a record-breaking 1,900' lava fountain issued from this now oxidized and revegetated Kilauea Iki vent. Falling cinder from this eruption sequence built the Pu'u Pua'i cone and buried the rain forest downwind to create the Devastation Area. June, 2000. 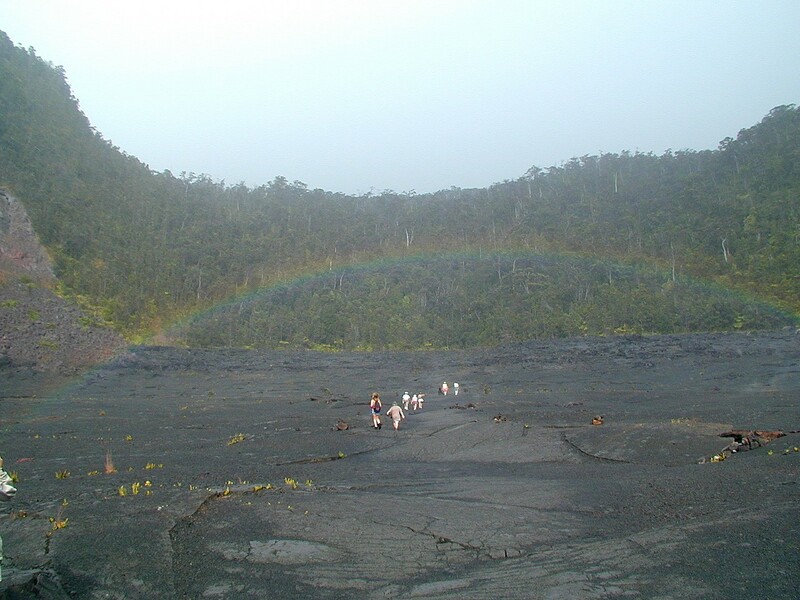 333 KB A light rain drew this elegant rainbow over our eastbound path across the floor of the Kilauea Iki pit crater. 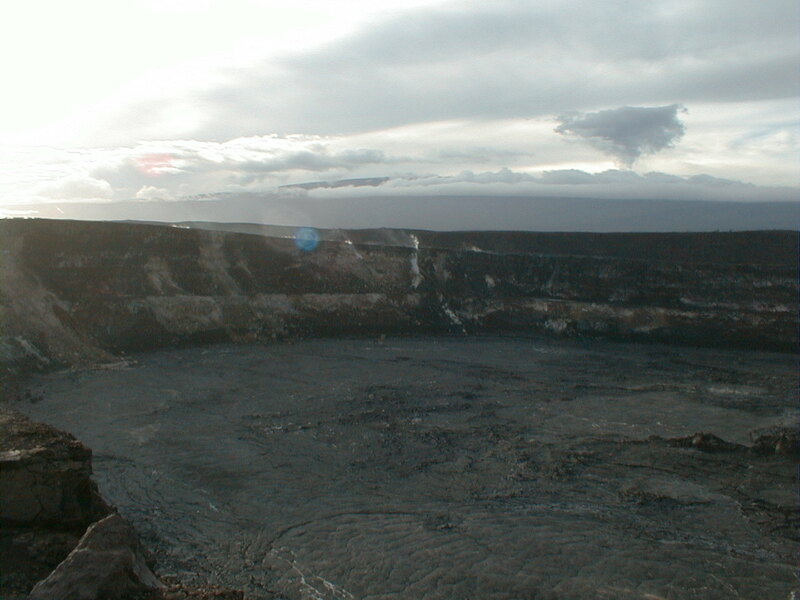 The lava lake formed by the 1959 eruption reached a depth of 400'. June, 2000. 414 KB The lush trail up the relatively low east wall of Kilauea Iki crater. The contrast with the stark crater floor is stunning. June, 2000. 272 KB The lee side of Pu'u Pua'i, the cinder cone built during the 1959 Kilauea Iki eruption. 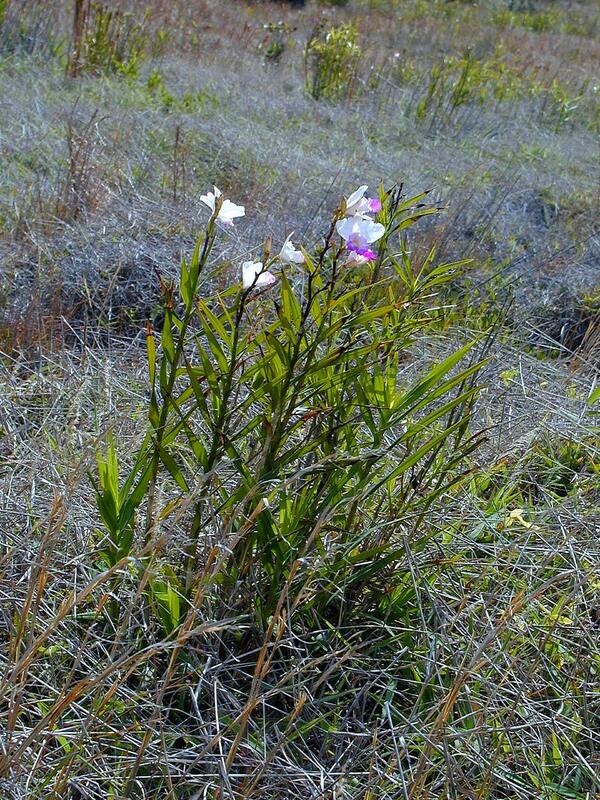 Patches of pink pulignum (sp?) pioneer the 2-meter-thick blanket of loose pumice cinder blown here by the trade winds during the prolonged 1959 eruption. June, 2000.